The Zippo lighter is a classic but, being a petrol lighter, is not suitable for cigar smokers and smokers in general. The odor and residue of the petrol will have an effect on the taste of the tobacco. 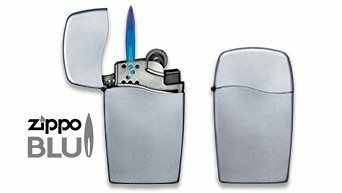 For this reason, Zippo has developed the new Zippo Blu lighter series which, like most other lighters nowadays, uses butane gas. Zippo still maintains the classic style with the Zippo flint and the Zippo friction wheel. This is a classic Zippo lighter.